There comes a point where you have to just call it done and let it go, and acknowledge that no book is perfect. No book ever makes it to publication 100% free of problems or errors, no matter which route to publication it takes. Your book will have imperfections. Some of those imperfections are what make up your style and voice. 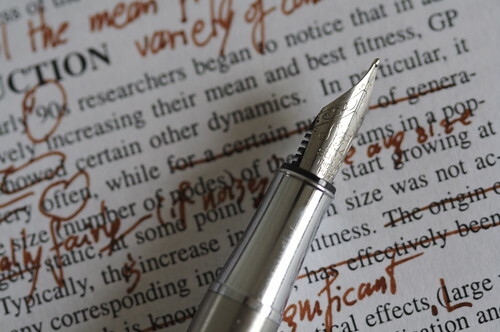 If you over-edit, which you can do, you run the risk of editing yourself–your voice and style, the thing that makes this book uniquely YOU–right out of your story. So how do you know when you’re there? One way to know is when your beta readers stop sending your manuscript back with notes pointing out things that need work and start telling you how great it is instead. But sometimes, beta readers can be nitpicky, and you have to learn to trust your gut about whether the problems they point out are indeed actual problems, or if they’re simply difficult to please. If you feel it’s the latter–especially if nobody else seems to have a problem with whatever it is they’re pointing out–you’ve got to accept that you can’t please everybody, and move on. – You’ve fixed glaring plot holes, and addressed the not-so-glaring ones in some way, whether that’s by plugging them up, offering some kind of hand-wavy explanation, or hanging a lantern on it–that is, having a character comment on the fact that it makes no darn sense. Generally, it’s best to plug up even the minor holes if you can, but sometimes you just have to resort to one of the other two techniques and move on. These are best reserved for things that qualify as fridge logic. – You’ve fixed continuity errors and anything else that might pull the reader out of the story. – You’ve cut boring scenes and tightened the pace (here’s a tip: if you get bored writing a scene, your readers will get bored reading it. It can go). – You’ve fixed grammatical errors, or made sure that any grammar rules you’ve broken were broken artfully and on purpose. – You’ve gone through and nuked words you tend to overuse (i.e., like, that, just), or gestures you repeat too often (he shrugged, she sighed, he shook his head), and converted passive tense to active. – You’ve read your dialogue out loud to make sure it’s not stilted or awkward. – You’ve corrected every typo, spelling mistake and formatting error that both you and your beta readers have been able to find. If you’ve done all of those things, and the majority of your beta readers are giving you the green light, then you’re done. Slap your cover on it, upload it to your publishing sites and have yourself another beverage before moving on to your next book. Christy and her manuscript Picture Perfect Lies. The runner up — and it’s a close second — is Tam Francis and The Girl in the Jitterbug Dress. Tam will be getting a certificate for 50% off of my standard rate. Congratulations to our winner! And I’d still love to hear from the rest of my readers. If you have any more questions on editing for indies, please don’t hesitate to leave them in the comments. Same goes for if you have any advice to ad! Woohoo! I’m so excited! Thank you for picking me. I know you’re going to be able to help me improve my manuscript remarkably. Should I email it to you at jmbauhaus@gmail.com? I’ve been meaning to contact you directly with instructions, but it’s been a busy week, so apologies that I didn’t get to you sooner (also, for some reason I never got a notification that you left a comment). But yes, you can e-mail it to me at that address.